ETA: Thanks for your comments, everyone! They are much appreciated. 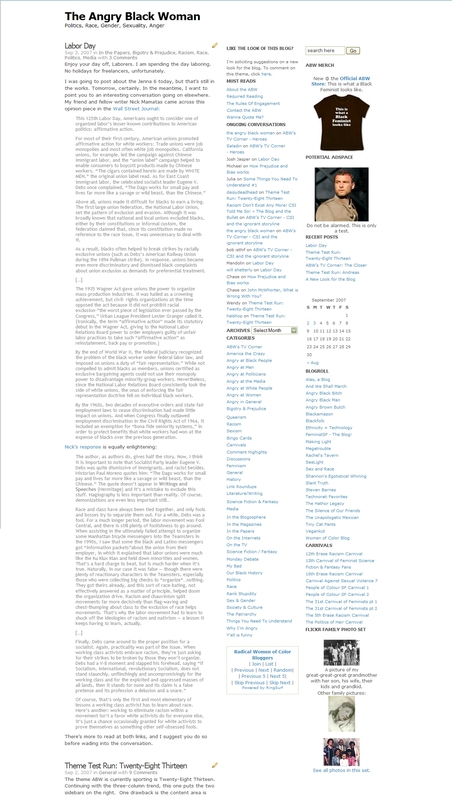 If you’d like to see what the blog looked like with the Twenty-Eight Thirteen theme, see this screenshot. 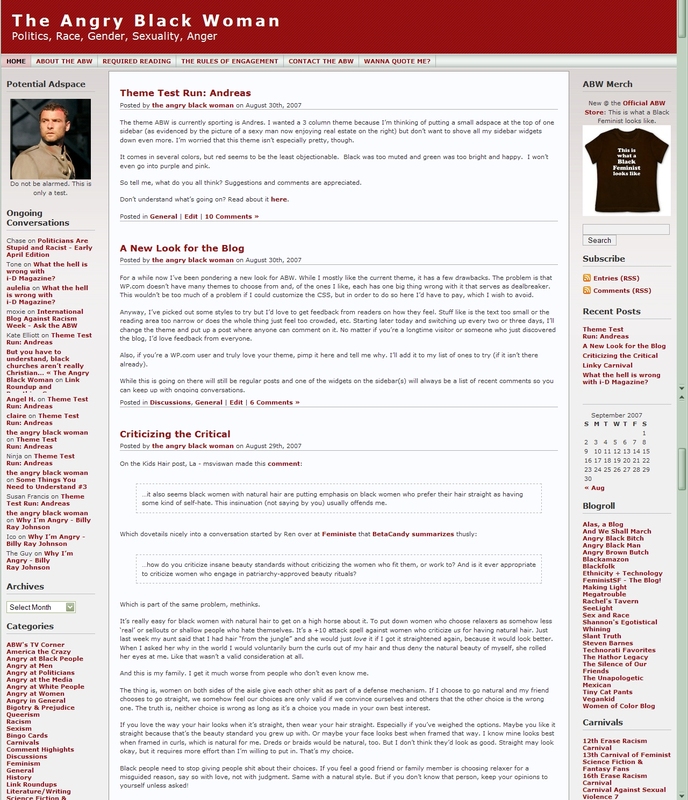 You can still comment on this theme if you like, but to comment on the theme currently in use, see the link in the “Like the look of this blog” area on the sidebar. Continuing with the three-column trend, this one puts the two sidebars on the right. One drawback is the content area is fixed, so I only have a narrow space to work with. I don’t know how I feel about that yet. I don’t know that the sidebar arrangement is how it will be if I make this permanent. I may have to play around with it a bit more. Suggestions and comments most appreciated! To see a screenshot of my last test theme, click here. Don’t understand what’s going on? Read about it here. I like the simplicity of it, even though a splash of color would be nice as well. The only issue I have, it appears to lack margins on the left side. Perphaps it’s just my computer settings, I don’t know. i like this alot, very sleek. i like this one. only one change suggested: put a fine line under the title banner to seperate it from the content. otherwise, it takes a little while to realize that it’s not a post title. I really like this one; I think it’s clean and neat looking. The text is very clear, but it needs a visual line between the content and the sidebars. I also think you’ll have problems with the narrow content area, especially with photos. I can’t edit any of the CSS for this without paying, which I wish to avoid, if I can. And that means I can’t add any lines. Not having said lines does strike me as dumb. I know they were going for “clean”, but they could have provided some way to separate the sections. If not lines, then slightly grey boxes? gah. Makes me wish I could make my own theme and submit ti to them. I like this one least well of the formats you’ve tried so far. I don’t like having the posts on the left instead of the center (although maybe that’s a good idea, metaphorically?). I don’t like it much either. Agree that it’s very cluttered.